Hey guys, I would like to first mention that I started a YouTube Channel! It took me about 3 years to finally start one because mostly I am just too camera video shy. I always wanted to do a video but I just kept making up a lot of excuses. Well I finally got enough courage to do it so I hope you guys will subscribe and look forward to a lot more videos in the future. I am thinking of different ideas for it right now so just stay tuned :) Click HERE to subscribe and watch my first video ever! Now onto my post...I did a first impression on this palette in my video but I didn't do any swatches. I wanted to get a new palette even though I have a lot just sitting around but I like to buy new things :) I walked around Sephora trying and testing out a lot of palettes but in the end I came home with this one. Mostly because it has half neutral colors and half bright bold colors and also because it has matte colors and the shimmer ones aren't too shimmery/glittery. I have super oily skin so I can't wear a lot of shiny glittery shimmery colors. Came with this How-To Look Book with different looks you can create with this palette and instructions. 24/7 Glide-on Eye Pencil that comes inside the palette. It goes on creamy and very smoothly but I can't wear it for my oily skin type. I can probably use it to tight line my eyes or even as an eyeshadow base when I want a dark dramatic look or when I want a color to pop. Also comes with a travel size UD Eyeshadow Primer. 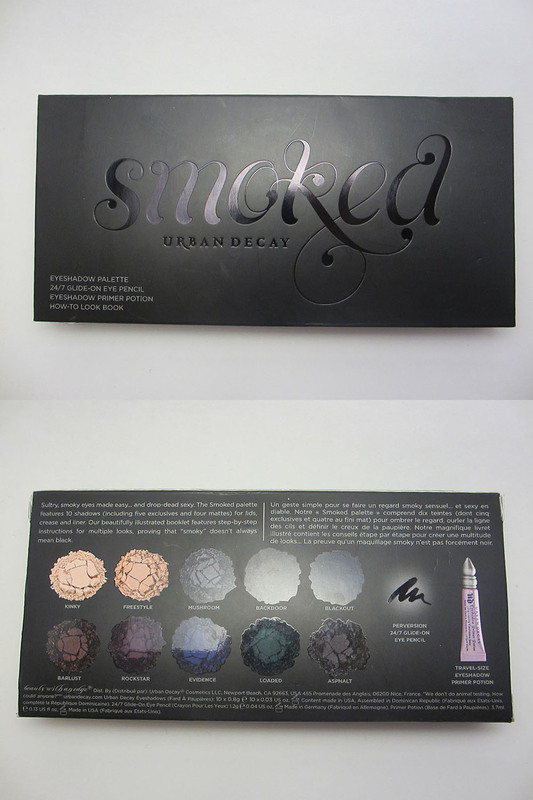 I love all the colors in this palette -- it's really pigmented and I always loved UD eyeshadows. As you can see from the picture Backdoor (brown) and Blackout (black) don't go on as well but I'm sure with primer I'll have no trouble with it. You should always use primer before putting any shadows on. It'll help the eyeshadows to stay put and last longer. Oh and there's some fall outs with these. I got my free Birthday gift from Sephora during that trip. Mini Make Up For Ever Smoky Extravagant Mascara and Rouge Artist Natural N9.